The sharp fall in the oil price in late 2014 was mostly due to supply rather than demand, with expectations of future supply more important than shifts in current production. We can conclude this by comparing a model using economic data with another using asset prices that capture expectations of future oil supply. Our supply side explanation implies the fall in the oil price is mostly good news for the UK and other oil importers, rather than mainly a signal of a weaker global economy. Between June 2014 and January this year, the price of crude oil fell by nearly 60%, one of the three largest falls since the 1970s (Chart 1). Even after the recovery in recent months, oil prices remain around 50% lower. Unlike previous large declines, there was no clear single trigger for the sharp fall up to January, such as a major recession or a very large change in OPEC production. Note: Oil price deflated by US personal consumption deflator indexed to January 2015. 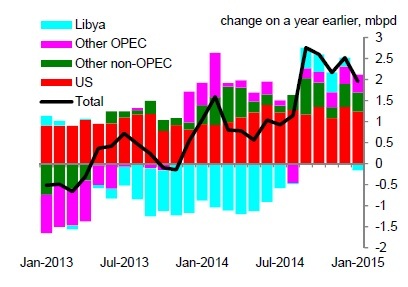 Rapid increase in the actual supply of oil due to the resumption of Libyan production and the ongoing US shale-oil production boom (Chart 2). 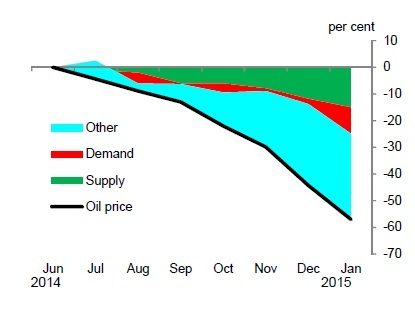 Higher future supply of oil due to the decision by OPEC in November not to cut production despite plummeting prices. Many market participants saw this as a signal that the OPEC was willing to tolerate lower prices, perhaps in an effort to undercut high-cost oil production like shale-oil. Slowing prospects for global growth, suggesting a weaker outlook for oil demand. 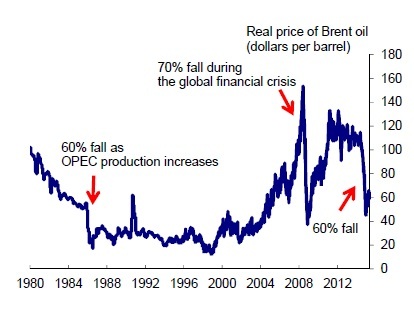 Identifying which of these explains the decline in the oil price is important. With 30 million barrels consumed every day in just the world’s two largest economies, China and the United States (and 1.5 million in the UK) cheaper oil due to an increase in supply is good news. However, a fall in prices caused by a weaker demand for oil would be a worrying signal of a slowing global economy. We show two ways to separate out the impact of supply and demand factors on the price of oil. The first uses economic and oil sector data such as global output and oil production. This is a sensible approach in that price changes may be caused by observable fundamental data that are clearly related to the demand and supply of oil. There are two downsides, however, the data is often published with a lag and participants in the oil markets are forward looking, and may not be responding to previous developments. The second approach uses asset price data. It assumes a variety of financial markets correctly price current and future economic and oil market fundamentals, like the ones that are used in the first approach. It identifies forward-looking supply or demand factors but cannot attribute them to specific fundamental causes. However, it is possible to do this decomposition at a daily frequency and, most importantly, to reflect expectations about the future. The first approach uses actual developments in the production of oil, change in oil inventories and economic activity to decompose oil price changes into demand and supply factors. It follows the methodology outlined in Kilian and Murphy (2014), which uses a Structural Vector Autoregression (SVAR) with sign-restrictions. That means the model attributes price moves to supply and demand depending on how well it matches the pattern we would expect to see in the data. For example, a positive demand shock should lead to rising prices, higher crude oil production, rising economic activity and a reduction in oil inventories. Conversely, a positive supply shock should lead to falling prices, rising crude production, rising economic activity and inventories. Of the 57% fall in prices between June 2014 and January 2015, this approach finds that just 15 percentage points were due to positive developments in oil supply (Chart 4). The contribution of reduced demand (as proxied by a global measure of industrial production) was just 10%. About 30 percentage points of the fall in prices is left unexplained by these first two factors. Given the SVAR is estimated using actual data, the extent to which it accounts for forward-looking supply and demand factors is limited. So, uncaptured changed perceptions over the reaction function of OPEC could explain the large residual in this first approach. Indeed, some of the largest falls in prices occurred after November 28, when OPEC announced they would not cut production despite the 30% fall in prices that had already occurred. A comparable SVAR detailed in the IMF’s April 2015 World Economic Outlook comes to a similar conclusion. Below, we detail a second approach that quantifies the extent to which forward-looking supply and demand factors may be responsible for the fall in oil prices. The pattern of changes in asset prices can be used to give us a forward looking assessment of whether the oil move was due to demand or supply. The basic intuition behind the approach is that various asset prices will respond differently to oil supply and demand shocks. For example, while the equity prices of oil companies tend to follow oil prices closely, retail equities would be expected to rise in the event of a positive demand shock but fall if oil prices rise due to a supply shock, as more expensive petrol saps the purchasing power of consumers. Specifically, the data used are 214 financial time series. The majority are equity sector indices for major oil consuming and producing countries. The sectors are chosen so that they are either sensitive to aggregate demand (like general retail or personal goods) or the oil sector (like oil equipment producers). The other data-series included are commodity prices, inflation swaps, interest rates, exchange rates against the dollar and sovereign CDS for oil producers. The daily changes in some of these variables are expected to have a different correlation with the oil price during a demand shock than a supply shock, while others should have the same correlation either way. There is thus a different expected pattern of correlations for supply shocks than demand shocks. Such patterns in the data can be identified statistically and used to construct synthetic variables called factors with a technique called partial least squares (PLS). Principal components is a similar technique that some readers may be familiar with; the main difference is that PLS constructs the factors based on the common co-movement of the data with a target variable, in this case the WTI oil price. The factors are constructed in such a way that they best explain the target variable but do not correlate with each other. In this case the factors are estimated for rolling windows of 5 years for daily data going back to 1986. For each window the factor is assigned to supply or demand depending on whether the underlying pattern matches the expected patterns described above. 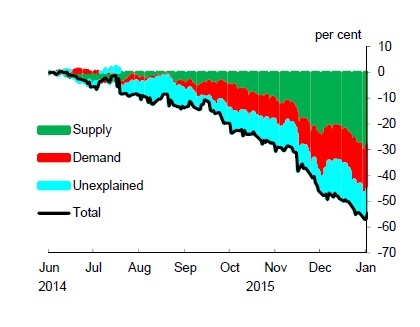 The model finds that the recent decline in the oil price is largely due to supply (Chart 6). The WTI oil price declined 57% between 16 June 2014 and 13 January 2015. About 30 percent point of that is attributed to supply, and another 17 percent point to demand, while the proportion of the fall that cannot be explained by the model is just 10 percent point. The New York Fed posted results from a similar model that also attributes the recent decline to supply. That model uses weekly rather than daily data. Our rolling estimation window means that more recent decompositions reflect up to 143 asset prices that are not available as far back as 1986. Both models have a common ancestor, presented in this post, which also contains a more detailed description of the PLS approach. Using the two models described above, we have shown that the recent fall in oil prices was mostly supply-driven. However, the first model approach using a sign-restricted VAR indicates that actual developments in oil production and global activity do not provide enough information to explain the total fall in prices. The second approach, using forward-looking asset prices, explains a larger proportion of the fall in oil prices. This approach may be better at capturing the expectations of market participants, who appear to have changed their assessment of the behaviour of OPEC. Consequently, we can be more confident that the fall in oil prices is good news for the UK economy and other oil importers. Authors: Gene Kindberg-Hanlon works in the Bank’s Global Spillovers & Interconnections Division and Menno Middeldorp works in the Bank’s Macro Financial Analysis Division.